In a bid to empower the Indian youth, Modi proposed to organize a mock parliamentary session in every district around August 15 next year. NEW DELHI: In a bid to empower the Indian youth, Prime Minister Narenda Modi on Sunday proposed to organize a mock parliamentary session in every district around August 15 next year. Addressing the nation through the 39th episode of his ‘Mann ki Baat’ radio programme, Prime Minister Modi suggested the move in order to engage with the youth to generate ideas on developing a ‘New India’. “We could organize a Mock Parliament in every district of India, where the youth of 18 to 25 years of age sit together and discuss ideas to build a New India, find ways, make plans regarding how we could accomplish our goals by 2022 and build an India that our freedom fighters dreamt of,” he said. Highlighting the importance of voting, Prime Minister Modi said it is the biggest power granted by a democracy, as voters have the leverage to transform the nation. “Tomorrow, January 1, is special. We welcome those born in the 21st century to the democratic system as they will become eligible voters. A vote is the most effective means of bringing positive change in the lives of millions. It can transform our nation,” he said. 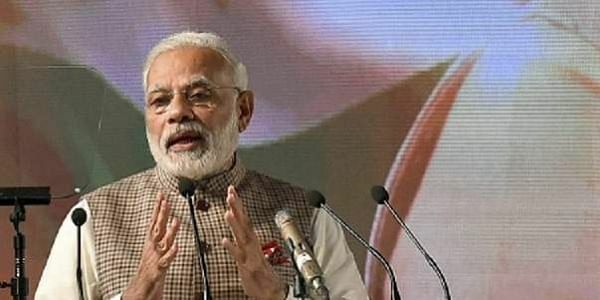 Re-iterating the importance of the Indian youth, Prime Minister Modi claimed that those aged 18 to 25, or the New India Youth, are filled with energy and enthusiasm, and are capable of assisting India scale greater heights of growth with their skill set. The concept of New India, Prime Minister Modi opined, is based on three pillars- Shanti, Ekta, and Sadbhavna. It aims at creating a nation free of casteism, communalism, corruption, filth and poverty; and a nation where ample opportunities are created and aspirations fulfilled. “From skill development to innovation and entrepreneurship, our youth are excelling in all fields. It is now time that a system is created where newest development opportunities are easily accessible for the New India Youth as soon as they turn 18,” he said. Prime Minister Modi also appealed to the nation to take concrete steps in the country’s transformation from Positive India to Progressive India in the New Year. Lack of idea sharing platforms especially platforms to share socialistic ideas that develop our nation is one of the main drawback of our nation. Even though our youths had extra ordinary potentials they don't have any stage to express it. Our nation is not utilizing the powerful ideas of that really powerful age.So instead of wasting their ideas we should give them chances to explore from their teenage.